Seeds of the future are planted in the present. The future is always arriving. In the dharma forest countless Buddhist traditions are alive today in Asia and the West, and I expect they will continue to evolve and flower long into the future. Like all conditioned things traditions change, but buddhadharma cannot be harmed or impeded. Buddhadharma is not going anywhere. But Buddhist traditions and institutions are always in motion, always changing. If we look closely we can glimpse their colors and outlines, their gifts and challenges. Here is a simple outline of what I am seeing and foreseeing, primarily in the United States, which I know best. My aim is to promote discussion, not to reach conclusions. Some of these developments appear positive (i.e., expansive) to me, and some appear negative (i.e., restrictive or destructive). But of course we know that what seems positive to one person can look very different to another. And we know that the dualistic notion of ?positive? and ?negative? include each other and are themselves subject to impermanence and transformation. With that caveat, here are some trends in the present leaning towards the future. Before going further, please note that generalizations about Buddhism and Buddhist practice can be mistaken and misleading. Buddhist trends in the United States are different from Europe. Buddhist traditions in Thailand differ from Japan. And so on. Among the different cultures of Asia, the many schools and styles of Buddhist practice in the United States, Europe, Asia, and elsewhere, it may be that we can really only agree that the Buddha taught about suffering and the end of suffering. The historical record, however uncertain, suggests that the monastic sangha followed a patriarchal cultural model from the beginning. Ultimately the bhikkhuni sangha died out in most of Asia, even though the record of women?s practice and devotion was and is compelling and unbroken. Over the last twenty years there have been some remarkable trends which start to deconstruct two thousand years of patriarchy and misogyny. In the West, fully half the teachers in our Zen and Vipassana centers are women, fully empowered to teach and transmit the dharma. In Asia there has been a revival of the bhikkuni order in many of the Theravada countries, and a strengthening of existing orders in the Mahayana schools. This development is uneven and sometimes controversial, but the tide is inexorable. Shakyamuni Buddha proposed a fourfold order: monks, nuns, laymen, laywomen. Over centuries the role of lay people has devolved into service for the monks, out of reverence for the robe and the Buddha himself. The underlying premise is that generosity and devotion towards the monks is meritorious action which will lead (at some indeterminate future) to rebirth as a monk oneself. But the Buddha never said that laypeople could not attain realization. With no disrespect for monastic life, there has been an unprecedented flowering of lay practice in the West and in Asia. Our local meditation halls and retreat centers are busy and growing. This is only logical in a troubled world. Women and men of all classes and backgrounds turn to the dharma as a path of peace and stability, a path they can follow themselves and pass on to their children. When I began working at Buddhist Peace Fellowship more than twenty years ago, engaged Buddhism was a marginal tendency in the West. ?Real? Buddhists would dismissively suggest that our practice was just conventional activism in Buddhist clothes. I have seen this perception change over the years. Buddhist centers are regularly teaching in prisons, feeding and sheltering the homeless, offering chaplaincy in hospitals and hospices, and turning out to protest against injustices and war at home and abroad. Many of us in the west have come to the dharma after turning away from our birth traditions of Christianity and Judaism. Still, principles of social justice at the heart of the Abrahamic traditions have a place in our own hearts. We are shaping a Western approach to Buddhism that integrates the Buddha?s teachings of ?just? and the old prophets? call for social justice. Asian Buddhism, though influenced by Western social thought, has always been engaged. Monks and nuns are symbiotically linked to their communities and cultures. They live side by side. Formally and informally they serve as teachers, counselors, and advocates. In decades of war in Vietnam Buddhist monastics healed the wounded and intervened against violence on both sides. In Burma?s 2007, Saffron Revolution, monks and nuns took to the streets in tens of thousands to protest the military junta?s oppression and exploitation of Burma?s peoples. I believe that we will continue to inspire and influence each other, moving towards a Buddhism that is independent of nationalism that supports social, economic, environmental, and religious rights across all borders. Then there are the difficult challenges we face . . .
Sectarianism is simply tribalism wearing religious robes. It is unfortunately prevalent in every religious tradition in every culture and age. It boils down to an assertion that my Buddhism is truer, realer, better than yours. It is a force that divides natural allies. Despite the best intentions of wise sisters and brothers it keeps raising its head. We separate ourselves on the basis of Mahayana/Hinayana, according to various interpretations of karma, on matters of monastic rules, and on a thousand obscure points of doctrine. Sectarianism also emerges where access to resources varies. This is clearest in poor nations. In such places, resources or the lack of resources can mean survival for people and for religious organizations. Material poverty can translate into envy and resentment. Those with relative privilege ? although the privilege may be very small ? are inclined to protect what they have. A kind of zero-sum mentality prevails which leads to stinginess rather than compassion and generosity. If anything, the gap between rich and poor has widened over the last twenty or thirty years. There are no signs yet that humankind is moving in the other direction. Fourteen years ago at a meeting of INEB?s Think Sangha we came up with a one-line description of the new dominant religion, consumerism: The meaning of one?s life, the acquisition and consumption of things. The economic paradigm clouds our minds. In this world meaning is money and money is meaning. Buddhists are not immune from this kind of deluded thinking. Buddhism is promoted by movie stars. A small number of charismatic Buddhists ? a couple of Asian men and a bunch of Western teachers, all of whom seem constantly to jet around the world ? grace the covers of slick magazines. Retreats promise the dream of peace and fulfillment . . . along with gourmet vegetarian food and comfortable beds. That is, if one has money to pay and leisure time to spend. I may be overstating the present problem. There are many wonderful and authentic teachers around, including many of those we see on magazine covers. The problem is not so much with the teachers or with retreats, but with an inexorable capitalist system that turns everything and everyone into objects which can be bought and sold. It is not getting any better. And this trend leads to my third concern. Over the last fifteen years in the West, Buddhist principles and practices are becoming key to a new ?mindfulness industry.? A creative approach to stress reduction and pain relief that began in a clinical setting has moved into corporation offices and even the military. I don?t necessarily think this is a bad idea. All beings rightly wish to be free from suffering. But I fear that this approach ? mindfulness as a ?technique? ? is a step away from the Three Treasures ? Buddha, Dharma, and Sangha ? and a step towards commodification or turning Buddhism into a self-improvement program. Centrally what seems missing to me is sila or ethics. It is a conundrum. We certainly hope to see people working mindfully in corporations and in the military. We hope they will behave ethically and openly with each other. But then we have to step back and look at whole systems. Corporations aim to sell us things, whether we need them or not. Their first principle is: expand or die. The military, while arguably serving a necessary role to protect and serve, most effectively seems to serve avaricious and imperial national interests. And this interest has been effectively co-opted by corporations themselves. So, if mindfulness supports ethical action within a system, what do we see when, mindfully, we look at the system itself? If the future is always arriving, then it is always arising in the present. At the same time, the future, like each moment of time, is independent. Even if we think we see what is going on now, it is impossible to predict what will happen. Nonetheless, our words and actions determine present and future times. Harmonious action, respectful words, and mutual appreciation are best practices for all times. I believe this has always been the heart of INEB. It is why I keep coming back. But these practices can never be taken for granted. They are so obvious to see . . . and so hard to do. 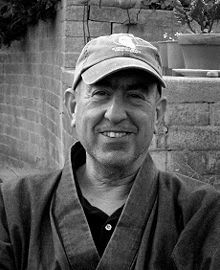 Hozan Alan Senauke is a Soto Zen Buddhist priest, vice-abbot of Berkeley Zen Center in California. Alan is founder of the Clear View Project, senior advisor to Buddhist Peace Fellowship, and a long-time friend of INEB. His latest book is The Bodhisattva?s Embrace: Dispatches from Engaged Buddhism?s Front Lines.